Ian Brown, who is currently eating is way across Canada in the name of the Globe and Mail, is having quite a year. His remarkable sort-of memoir, The Boy in the Moon (Random House Canad) won the Trillium Award for the best English-language book by an Ontario author. Brown has also won the Charles Taylor Prize for non-fiction and the B.C. 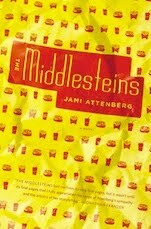 Book Prize. The Trillium Award for the best French-language book went to Ryad Assani-Razaki for his short-story collection Deux Cercles (VLB éditeur). It's his debut collection and deals with issues of alienation and immigration. 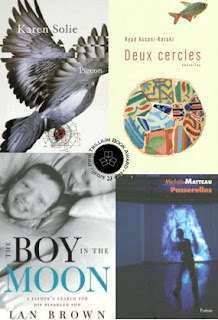 The Trillium awards for poetry went to Karen Solie (English-language) for her collection Pigeon (House of Anansi Press), which also won the Griffin Prize earlier this month, and to Michèle Matteau (French-language) for her collection Passerelles (Les Éditions l'Interligne). Matteau is a novelist and Passerelles is her first collection of poetry (with its success, we can only hope to see more of her poetry); her first novel À ta santé, la vie! won the Trillium Award in 2001. Congrats to all the winners. The Trillium Award is worth $25,000, which is a pretty nice payday really. Image shown a collection of the covers of the winning books.